The I/O is Smith’s original interchangeable lens goggle and the I/O 7 is the latest update. While many of its competitors have created easier interchange systems, the I/O 7’s lens takes longer to change and is clunkier than the others in this test. Thankfully, the I/O 7’s great fit, quality lens options, and nice extras make up for the hassle. In testing, we didn’t experience any fogging with Smith’s Vapor Lens technology and Porex Filter. There is good venting all around the goggle frame. There is a good field of view for what Smith calls a “Medium” size frame, but nothing exceptional and certainly less expansive than “oversize” models. The 7 has many options, most of which are mirrored, allowing for seemingly endless combinations of lenses and different colored frames. The spherical Carbonix-X lenses are high quality, but nothing exceptional in terms of clarity. There is great flexibility and structure to this frame, but the multi-step interchange system is far too labor (and fingerprint) intensive. 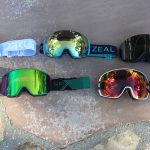 Many competitors’ interchange systems are easy to execute on a ski lift, but the I/O 7 takes far more time and effort than most other goggles I’ve used. Also, while some may like the buckle on the goggle strap, it’s placed dead-center where most helmets have a clip for the strap. The goggle strap buckle under the helmet clip renders some helmets incompatible with this goggle. The strap connects to the frame with a great “dual axis” outrigger that makes for exceptional flexibility. This resulted in a good fit on my face and in my helmet.